This post will probably be of little or no interest to you. I wrote it to get somewhat more acquainted with logarithms myself. Indeed, I struggle with them. I think they come across as difficult because we don’t learn about the logarithmic function when we learn about the exponential function: we only learn logarithms later – much later. And we don’t use them a lot: exponential functions pop up everywhere, but logarithms not so much. Therefore, we are not as familiar with them as we should be. The second point issue is notation: x = loga(y) looks more terrifying than y = ax because… Well… Too many letters. It would be more logical to apply the same economy of symbols. We could just write x = ay instead of loga(y), for example, using a subscript in front of the variable–as opposed to a superscript behind the variable, as we do for the exponential function. Or, else, we could be equally verbose for the exponential function and write y = expa(x) instead of y = ax. In fact, you’ll find such more explicit expressions in spreadsheets and other software, because these don’t take subscripts or superscripts. And then, of course, we also have the use of the Euler number e in ex and ln(x). While it’s just a real number, e is not as familiar to us as π, and that’s again because we learned trigonometry before we learned advanced calculus. Historically, however, the exponential and logarithmic functions were ‘invented’, so to say, around the same time and by the same people: they are associated with John Napier, a Scot (1550–1617), and Henry Briggs, an Englishman (1561–1630). Briggs is best known for the so-called common (i.e. base 10) logarithm tables, which he published in 1624 as the Arithmetica Logarithmica. It is logical that the mathematical formalism needed to deal with both was invented around the same time, because they are each other’s inverse: if y = ax, then x = loga(y). These Briggs tables were used, in their original format more or less, until computers took over. Indeed, it’s funny to read what Feynman writes about these tables in 1965: “We are all familiar with the way to multiply numbers if we have a table of logarithms.” (Feynman’s Lectures, p. 22-4). Well… Not any more. 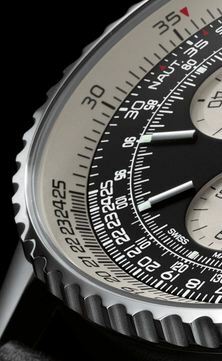 And those slide rules, or slipsticks as they were called in the US, have disappeared as well, although you can still find circular slide rules on some expensive watches, like the one below. How does it work? Well… These slide rules can be used for a number of things but their most basic function is to multiply numbers indeed, and that function is based on the logb(ac) = logb(a) + logb(c). In fact, this works for any base so we can just write log(ac) = log(a) + log(c). So the numbers on the slide rule below are the a, b and c. Note that the slides start with 1 because we’re working with positive numbers only and log(1) = 0, so that corresponds with the zero point indeed. The example below is simple (2 times 3 is six, obviously): it would have been better to demonstrate 1.55×2.35 or something. But you see how it goes: we add log(2) and log(3) to get log(6) = log(2×3). For 1.55×2.35, the slider would show a position between 3.6 and 3.7. The calculator on my $30 Nokia phone gives me 3.6425. So, yes, it’s not far off. However, it’s hard to imagine that engineers and scientists actually used these slide rules over the past 300 years or so, if not longer. Of course, Briggs’ tables are more accurate. It’s quite amazing really: he calculated the logarithms of 30,000 (natural) numbers to to fourteen decimal places. It’s quite instructive to check how he did that: all he did, basically, was to calculate successive square roots of 10. Yes. The secret behind is the basic rule of exponentiation: exponentiation is repeated multiplication, and so we can write: am+n =aman and, more importantly, am–n = ama–n = am/an. Because Briggs used the common base 10, we should write 10m–n = 10m/10n. Now Briggs had a table with the successive square roots of 10, like the one below (it’s only six significant digits behind the decimal point, not fourteen, but I just want to demonstrate the principle here), and so that’s basically what he used to calculate the logarithm (to base 10) of 30,000 numbers! Talking patience ! Can you imagine him doing that, day after day, week after week, month after month, year after year? Waw ! So how did he do it? Well… Let’s do it for x = log10(2) = log(2). So we need to find some x for which 10x = 2. From the table above, it’s obvious that log(2) cannot be 1/2 (= 0.5), because 101/2 = 3.162278, so that’s too big (bigger than 2). Hence, x = log(2) must be smaller than 0.5 = 1/2. On the other hand, we can see that x will be bigger than 1/4 = 0.25 because 101/4 = 1.778279, and so that’s less than 2. [If you’re in doubt, just check using your calculator.] We now need log(10x–0.25) = log(1.124683). Now, 1.124683 is between 1.154782 and 1.074608 in the table. So we’ll use the lowest value (101/32) to take another factor out. Hence, we do another division: 1.124683/1.074608 = 1.046598. So now we have 2 = 10x = 10[1/4 + 1/32 + (x – 1/4 – 1/32)] = (1.778279)(1.074608)(1.046598). We now need log(10x–1/4–1/32) = log(1.046598). We check the table once again, and see that 1.046598 is bigger than the value for 101/64, so now we can take that 101/64 value out by doing another division. (10x–1/4–1/32)/101/64 = 1.046598/1.036633 = 1.009613. Waw, this is getting small! However, we can still take an additional factor out because it’s larger than the 1.009035 value in the table. So we can do another division: 1.009613/1.009035 = 1.000573. So now we have 2 = 10x = 10[1/4 + 1/32 + 1/64 + 1/256 + (x – 1/4 –1/32 – 1/64 –1/256)] = 101/4101/32101/64101/25610x–1/4–1/32–1/64–1/256 = (1.778279)(1.074608)(1.036633)(1.009035)(1.000573). So log(2) is approximated by 0.25 + 0.03125 + 0.015625 + 0.00390625 + 0.000248 = 0.30103. 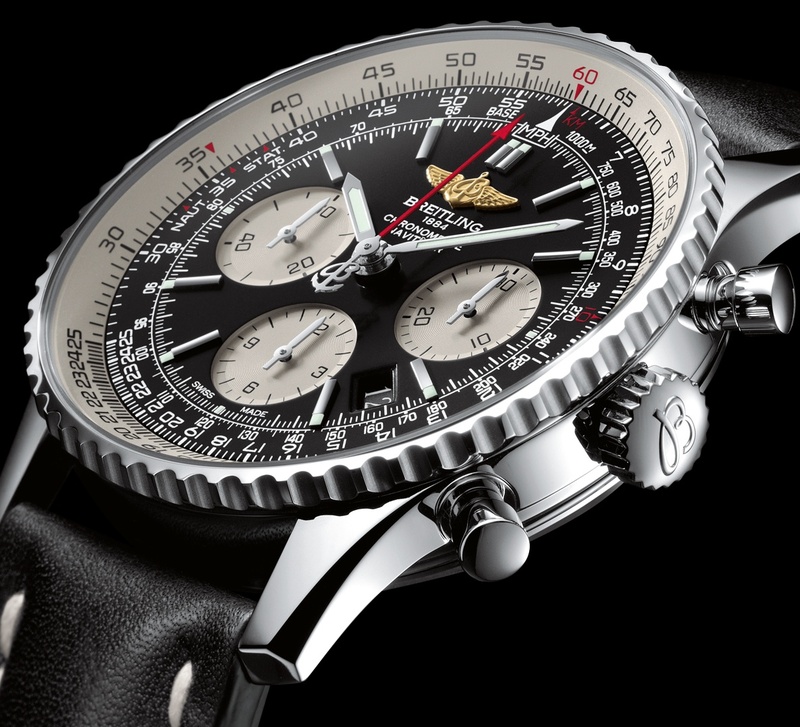 Now, you can check this easily: it’s essentially correct, to an accuracy of six digits that is! The proof of this follows the proof of the product rule, and so I’ll let you work on that. Is that it? Well… Yes. Or no. Let me add a few more lines on these logarithmic scales that you often encounter in various graphs. It the same scale as those logarithmic scales used for that slide that we showed above but it covers several orders of magnitude, all equally spaced: 1, 10, 100, 1000, etcetera, instead of 0, 1, 2, 3, etcetera. 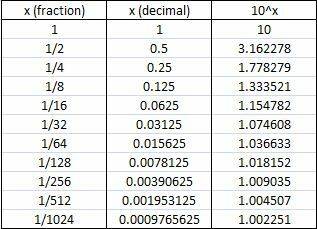 So each unit increase on the scale corresponds to a unit increase of the exponent for a given base (base 10 in this case): 101, 102, 103, etcetera. 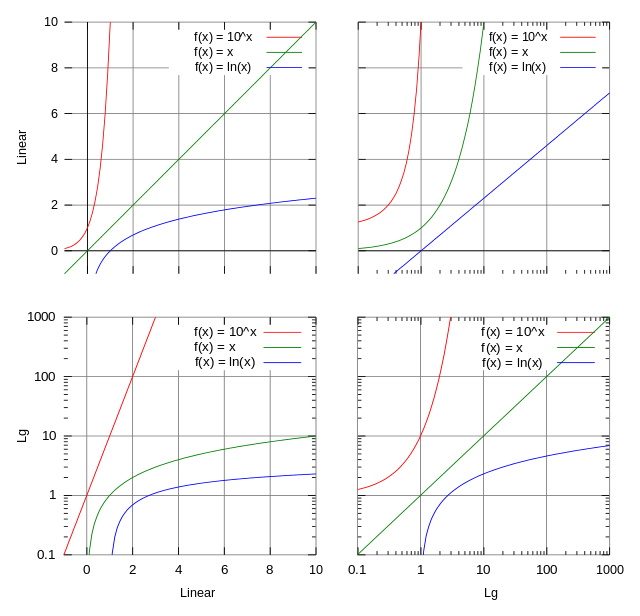 The illustration below (which I took from Wikipedia) compares logarithmic scales to linear ones, for one or both axes. And, of course, we could say the same for the distance between 1 and 1000, and 0.1 and 100. The distance on the scale is 3 units here, while the point is 1000 = 103 the other point. Why would we use logarithmic scales? Well… Large quantities are often better expressed like that. For example, the Richter scale used to measure the magnitude of an earthquake is just a base–10 logarithmic scale. With magnitude, we mean the amplitude of the seismic waves here. So an earthquake that registers 5.0 units on the Richter scale has a ‘shaking amplitude’ that is 10 times greater than that of an earthquake that registers 4.0. Both are fairly light earthquakes, however: magnitude 7, 8 or 9 are the big killers. Note that, theoretically, we could have earthquakes of a magnitude higher than 10 on the Richter scale: scientists think that the asteroid that created the Chicxulub crater created a cataclysm that would have measured 13 on Richter’s scale, and they associate it with the extinction of the dinosaurs. The decibel, measuring the level of sound, is another logarithmic unit, so the power associated with 40 decibel is not two times but one hundred times that of 20 decibel!